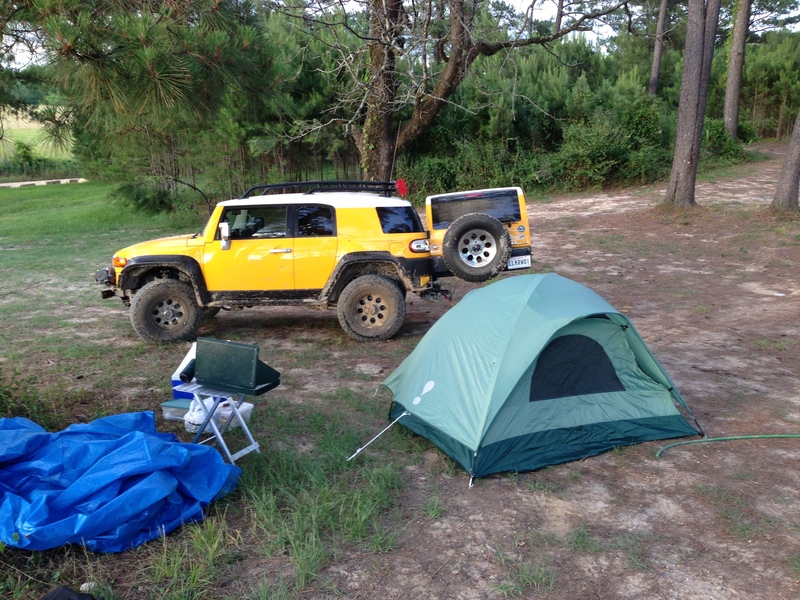 This post describes the nearest ORV park in Louisiana, Catahoula ORV park in Sicily Island, Louisiana. Sicily Island is like Manhattan, i.e., it is surrounded by rivers but is technically an island. 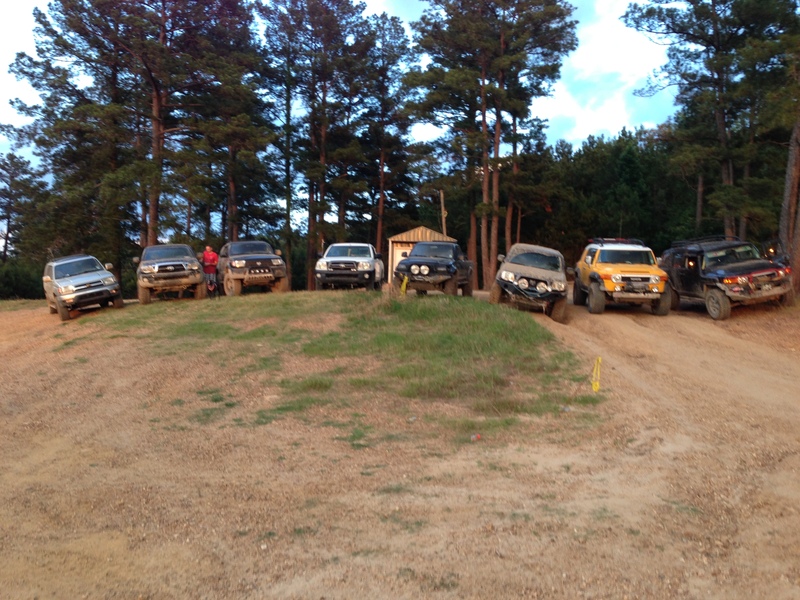 The ORV park is located 5 miles west of town near the Ouachita River, in a well-developed drainage basin < 20 miles from the Mississippi R. The geologic map of LA shows why this park exists. The rectangle outlines the general vicinity, which straddles the transition from Eocene (56-34 MA) rocks to the recent sediments of the coastal plain. The map scale does not allow us to see what we will encounter on the ground, however, and that is one of the purposes of this blog. 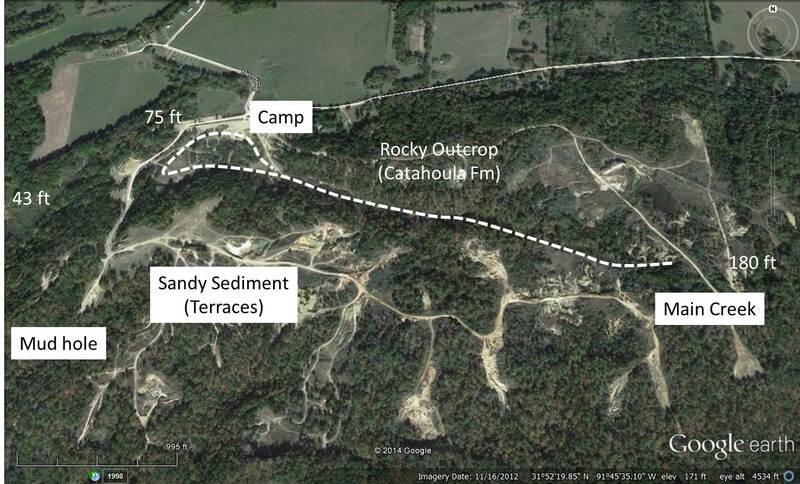 The geologic map suggests that we should see Oligocene (34-23 MA) rocks of the Catahoula Fm. originally deposited in rivers and streams. 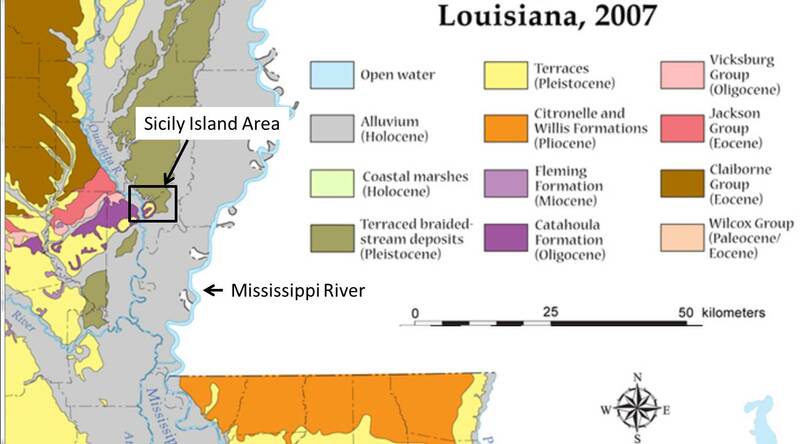 These are sandy sediments, but the underlying Vicksburg (pink on the map) contains marine limestone. We don’t really expect to see any older rocks here because, despite the relief (~100 feet), there are no faults in this region, which would move rocks vertically and expose even older ones (see previous post). The dominant geological feature is the southward (seaward) dip of Tertiary sedimentary rocks with erosion exposing ever older rocks towards the north. This tilt toward the Gulf of Mexico is associated with the Mississippi Embayment, which is of uncertain geological origin, although it is certainly valuable in terms of oil and gas buried deep within the Tertiary formations on the map. A blanket of river sediment is deposited over it all (Pleistocene stream deposits and terraces on map). These sediments were eroded from the older rocks of the Tertiary (i.e. Pliocene, Miocene, etc.) and reworked by braided rivers like those seen in the arid southwest US. The higher sea level (~300 feet) during the Sangamon Ice age (see Florida posts) was not a factor even at these lower elevations (< 200 feet) because the elevation was much higher than now due to erosion of an uncertain amount of material eroded during the last million years. This image shows the approximate area of the inset on the geologic map. 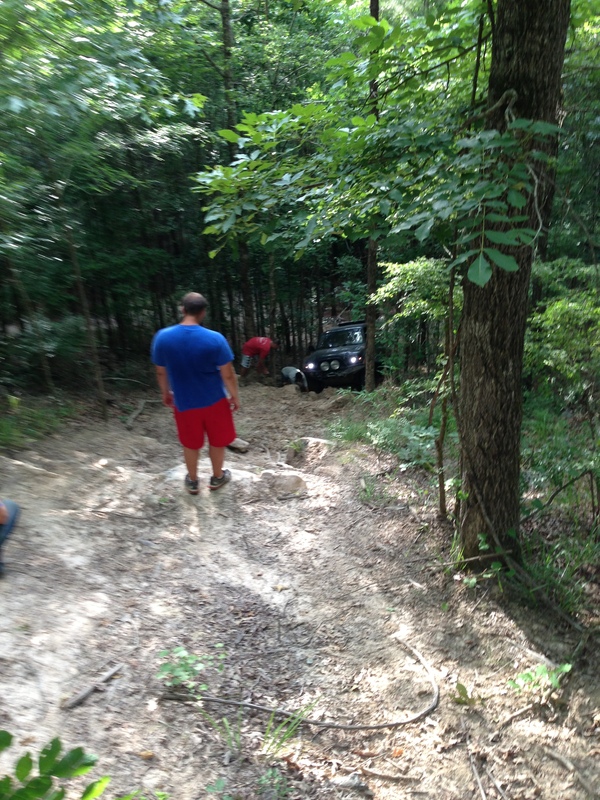 There is a creek (Main Creek) with a sandy bottom that is very nice to drive up. The rocky outcrop to the NE is probably Catahoula Fm., and it appears to be dominantly sandstone here. These are the best rock climbing trails from the creek (elevation ~80 ft) to the ridge at 180 ft. The bath house is at the Camp on the map. We set our tents up around this area, which was a sandy sediment. The terraces are a nice quality sand for building material and there is a quarry along the ridge SW of the main creek. In fact, the park is an abandoned quarry and the creek doesn’t have an outlet, as indicated by the closed loop (dash line). 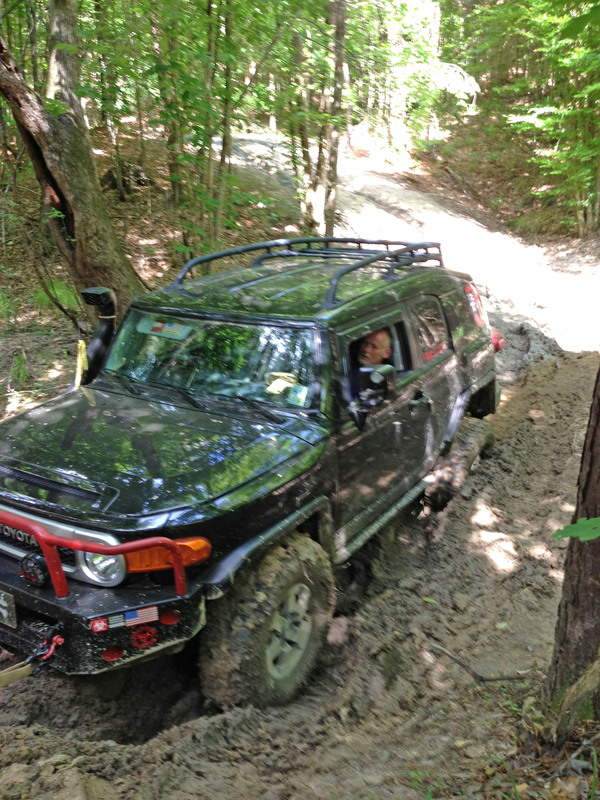 At lower elevations, e.g., the Mud hole, it is very dicey getting through and sometimes we don’t make it. Because of the mixed stream deposits of the Catahoula and the overlying terraces, even the muddy areas have rocky exposures for challenging climbing, with many loose boulders. The texture of the terrace deposits can be seen in this final shot as we were preparing to depart for southern Louisiana, leaving the rocks of Catahoula behind.